A simple pendulum of length ℓ is suspended from the point O (fig.). The bob of the pendulum is a sphere of mass m and is initially at rest at A. An identical sphere S (not shown in the figure), which is a projectile with its trajectory in the plane of the figure, has its highest point at A. The projectile therefore collides (elastically) with the bob of the pendulum at A and makes it move with horizontal speed V1 as shown. 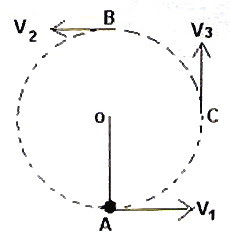 The acceleration due to gravity at the place is g.
(a) If the speed V1 of the bob of the pendulum is just sufficient to make it travel along the circular path of radius ℓ, derive an expression for the speed V2 of the bob at the highest point B of the circular path. (b) Derive an expression for the kinetic energy of the bob in terms of m, ℓ and g just when it starts moving from A. (c) Obtain an expression for the speed of the bob at C, when the string of the pendulum is horizontal. (d) What was the kinetic energy of the projectile (sphere S) just before it collided with the bob? Give reason for your answer without writing theoretical steps. (e) Briefly explain the nature of the motion of the projectile after hitting the bob. Try to answer the above question which carries 15 points (3+4+4+2+2). I’ll be back with the answer shortly.